Map of Cranbury Township in Middlesex County. Inset: Location of Middlesex County highlighted in the State of New Jersey. Cranbury is a township in Middlesex County, New Jersey, United States. As of the 2010 United States Census, the township's population was 3,857. Cranbury joins Bellmawr, Egg Harbor Township, Montclair and Woodbridge Township as one of the five municipalities (of 565 in the state) that have authorized dispensaries for the sale of medical marijuana. A deed for a sale of land and improvements dated March 1, 1698, is the earliest evidence of buildings constructed in present-day Cranbury. A home in Cranbury was used by Alexander Hamilton and the Marquis de Lafayette as a headquarters during the American Revolutionary War, and they were visited by General George Washington on June 26, 1778. As part of orders issued during the Presidency of George Washington, maps of Cranbury were made showing the presence of a church, a mill and 25 other buildings. During its earliest years, the location was usually spelled as "Cranberry". Rev. Joseph G. Symmes argued in 1857 that the name was spelled improperly and that the suffix "bury" was more appropriate, leading the name of the community and brook to be changed to "Cranbury" in 1869. The name has been attributed to wild cranberries that grew in the area. The so-called Hightstown rail accident occurred in or near Cranbury, in 1833. According to John Quincy Adams, who was aboard the train and who wrote in his diary about it, the train was 3 miles (4.8 km) from Hightstown when the disaster struck, putting the accident near what is now Cranbury Station. Among the passengers aboard were Tyrone Power and Cornelius Vanderbilt. Cranbury was incorporated as a township by an act of the New Jersey Legislature on March 7, 1872, from portions of both Monroe Township and South Brunswick Township. Portions of the township were taken on April 1, 1919, to form Plainsboro Township. George Washington's headquarters were located in Cranbury while planning for the Battle of Monmouth, a major turning point during the Revolutionary War. Many buildings on Cranbury's Main Street and in the surrounding area date to the 18th or 19th century. The entire downtown area is designated as a Historic District, which was added to the National Register of Historic Places in 1980 as District #80002502. The township celebrated its tricentennial in 1998. Updike Parsonage Barn was relocated and reconstructed in 2010. According to the United States Census Bureau, the township had a total area of 13.397 square miles (34.697 km2), including 13.247 square miles (34.309 km2) of land and 0.150 square miles (0.389 km2) of water (1.12%). Cranbury CDP (2010 Census population of 2,181) is an unincorporated community and census-designated place (CDP) located within Cranbury Township. Despite the match between the name of the Township and the CDP, the two are not one and the same, as was the case for most paired Township / CDP combinations (i.e., a CDP with the same as its parent township) before the 2010 Census, when most such paired CDPs were coextensive with a township of the same name. Other unincorporated communities, localities and place names located partially or completely within the township include Brain Grove Lake, Cranbury Station, Wescott and Wyckoffs Mills. The township borders Plainsboro Township, Monroe Township and South Brunswick Township in Middlesex County; and East Windsor Township in Mercer County. As of the 2010 United States Census, there were 3,857 people, 1,320 households, and 1,059.960 families residing in the township. The population density was 291.2 per square mile (112.4/km2). There were 1,371 housing units at an average density of 103.5 per square mile (40.0/km2). The racial makeup of the township was 80.53% (3,106) White, 3.45% (133) Black or African American, 0.10% (4) Native American, 13.74% (530) Asian, 0.03% (1) Pacific Islander, 0.36% (14) from other races, and 1.79% (69) from two or more races. Hispanic or Latino of any race were 2.57% (99) of the population. There were 1,320 households out of which 41.4% had children under the age of 18 living with them, 71.3% were married couples living together, 7.0% had a female householder with no husband present, and 19.7% were non-families. 17.5% of all households were made up of individuals, and 7.8% had someone living alone who was 65 years of age or older. The average household size was 2.82 and the average family size was 3.21. In the township, the population was spread out with 27.2% under the age of 18, 5.4% from 18 to 24, 15.1% from 25 to 44, 35.5% from 45 to 64, and 16.6% who were 65 years of age or older. The median age was 46.2 years. For every 100 females there were 94.2 males. For every 100 females ages 18 and older there were 88.2 males. The Census Bureau's 2006-2010 American Community Survey showed that (in 2010 inflation-adjusted dollars) median household income was $131,667 (with a margin of error of +/- $21,076) and the median family income was $146,250 (+/- $24,045). Males had a median income of $122,566 (+/- $25,917) versus $60,781 (+/- $22,066) for females. The per capita income for the borough was $55,236 (+/- $5,718). About 3.1% of families and 4.1% of the population were below the poverty line, including 8.2% of those under age 18 and 0.0% of those age 65 or over. As of the 2000 United States Census there were 3,227 people, 1,091 households, and 877 families residing in the township. The population density was 240.6 people per square mile (92.9/km²). There were 1,121 housing units at an average density of 83.6 per square mile (32.3/km²). The racial makeup of the township was 88.78% White, 2.26% African American, 7.41% Asian, 0.22% from other races, and 1.33% from two or more races. Hispanic or Latino of any race were 1.70% of the population. There were 1,091 households out of which 46.3% had children under the age of 18 living with them, 74.6% were married couples living together, 4.3% had a female householder with no husband present, and 19.6% were non-families. 16.3% of all households were made up of individuals and 7.9% had someone living alone who was 65 years of age or older. The average household size was 2.92 and the average family size was 3.31. In the township the population was spread out with 30.4% under the age of 18, 3.4% from 18 to 24, 27.6% from 25 to 44, 27.3% from 45 to 64, and 11.2% who were 65 years of age or older. The median age was 40 years. For every 100 females, there were 93.3 males. For every 100 females age 18 and over, there were 90.4 males. The median income for a household in the township was $111,680, and the median income for a family was $128,410. Males had a median income of $94,683 versus $44,167 for females. The per capita income for the township was $50,698. About 0.7% of families and 1.6% of the population were below the poverty line, including 2.7% of those under age 18 and 0.9% of those age 65 or over. Cranbury Township is governed under the Township form of government. The five-member Township Committee is elected directly by the voters at-large in partisan elections to serve three-year terms of office on a staggered basis, with either one or two seats coming up for election each year as part of the November general election in a three-year cycle. At an annual reorganization meeting, the Township Committee selects one of its members to serve as Mayor. In 1990, the Cranbury Township Committee was expanded from three to five members and the position of Township Administrator by ordinance. As of 2016[update], members of the Cranbury Township Committee are Mayor Daniel P. Mulligan, III (R, term of office on committee and as mayor ends December 31, 2016), Deputy mayor Glenn R. Johnson (D, term on committee and as deputy mayor ends 2016), David W. Cook (D, 2018), Susan J. Goetz (D, 2017) and James M. Taylor (D, 2018). Cranbury Township is located in the 12th Congressional District and is part of New Jersey's 14th state legislative district. As of March 23, 2011, there were a total of 2,768 registered voters in Cranbury Township, of which 836 (30.2%) were registered as Democrats, 684 (24.7%) were registered as Republicans and 1,246 (45.0%) were registered as Unaffiliated. There were 2 voters registered to other parties. In the 2012 presidential election, Democrat Barack Obama received 52.0% of the vote (1,076 cast), ahead of Republican Mitt Romney with 46.9% (971 votes), and other candidates with 1.1% (22 votes), among the 2,082 ballots cast by the township's 2,839 registered voters (13 ballots were spoiled), for a turnout of 73.3%. In the 2008 presidential election, Democrat Barack Obama received 53.0% of the vote (1,153 cast), ahead of Republican John McCain with 45.3% (986 votes) and other candidates with 1.3% (29 votes), among the 2,176 ballots cast by the township's 2,777 registered voters, for a turnout of 78.4%. In the 2004 presidential election, Republican George W. Bush received 50.8% of the vote (1,044 ballots cast), outpolling Democrat John Kerry with 48.0% (987 votes) and other candidates with 0.9% (23 votes), among the 2,055 ballots cast by the township's 2,510 registered voters, for a turnout percentage of 81.9. In the 2013 gubernatorial election, Republican Chris Christie received 67.1% of the vote (941 cast), ahead of Democrat Barbara Buono with 31.3% (439 votes), and other candidates with 1.6% (22 votes), among the 1,421 ballots cast by the township's 2,850 registered voters (19 ballots were spoiled), for a turnout of 49.9%. In the 2009 gubernatorial election, Republican Chris Christie received 54.6% of the vote (901 ballots cast), ahead of Democrat Jon Corzine with 35.5% (585 votes), Independent Chris Daggett with 8.7% (144 votes) and other candidates with 0.7% (11 votes), among the 1,649 ballots cast by the township's 2,711 registered voters, yielding a 60.8% turnout. The Cranbury School District serves children in public school for pre-kindergarten through eighth grade at Cranbury School. As of the 2014-15 school year, the district and its one school had an enrollment of 765 students and 55.0 classroom teachers (on an FTE basis), for a student–teacher ratio of 13.9:1. For the 1996-97, 2009–10 and 2016–17 school years, Cranbury School was formally designated as a National Blue Ribbon School, the highest honor that an American public school can achieve. During the 2009-10 school year, Cranbury School was awarded the Blue Ribbon School Award of Excellence a second time, and a third time for the 2016-17 school year. 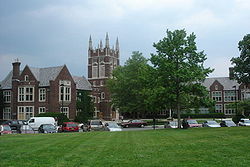 For ninth through twelfth grades, students move on to Princeton High School in Princeton, as part of a sending/receiving relationship with the Princeton Public Schools. Cranbury Township is granted a non-voting seat on the Princeton Regional Schools Board of Education, with the designated representative only voting on issues pertaining to Princeton High School and district-wide issues. As of the 2014-15 school year, the high school had an enrollment of 1,519 students and 126.0 classroom teachers (on an FTE basis), for a student–teacher ratio of 12.1:1. Cranbury students had attended Hightstown High School and then Lawrence High School before the relationship was established with Princeton. The Cranbury Public Library serves Cranbury residents, sharing a facility with the Cranbury School. As of May 2010[update], the township had a total of 51.25 miles (82.48 km) of roadways, of which 31.08 miles (50.02 km) were maintained by the municipality, 12.85 miles (20.68 km) by Middlesex County and 3.16 miles (5.09 km) by the New Jersey Department of Transportation and 4.16 miles (6.69 km) by the New Jersey Turnpike Authority. Cranbury hosts a 4-mile (6.4 km) section of Interstate 95 (the New Jersey Turnpike). While there are no exits in Cranbury, the township is accessible by the Turnpike in neighboring East Windsor Township (Exit 8) and Monroe Township (Exit 8A). The Molly Pitcher Service Area is located at mile marker 71.7 on the southbound side. Other significant roads passing through Cranbury include U.S. Route 130, County Route 535, County Route 539, County Route 615, and County Route 614. Middlesex County offers the M6 MCAT shuttle route providing service to Jamesburg and Plainsboro Township. Cranbury is host to many warehouses along Route 130 and the roads leading to the NJ Turnpike. A company making the Boy Scout Pinewood Derby cars is also here. Cranbury was noted for a used Rolls-Royce dealership located in the center of town, but it has gone out of business. The alternative energy business Blacklight Power, which occupies a building formerly occupied by Creative Playthings, is in fact located in East Windsor, in an area served by the Cranbury Post Office. See also: Category:People from Cranbury, New Jersey. Melanie Balcomb (born 1962), head coach of the Vanderbilt Commodores Women's Basketball team. Todd Beamer (1968–2001), passenger aboard United Airlines Flight 93, who said "Let's roll" to fellow passengers with whom he was planning an attack on terrorists who had taken over the cockpit. Ronald C. Davidson (1941-2016), physicist, professor and scientific administrator who served as the first director of the MIT Plasma Science and Fusion Center and as director of the Princeton Plasma Physics Laboratory. Scott Brunner (born 1957): NFL Quarterback from 1981-1986 most notably for the NY Giants. He lived here for over 20 years and raised his 3 children here. Cicero Hunt Lewis (1826–1897), merchant. Charles McKnight (1750-1791), physician during and after the American Revolutionary War. Jan Morris (born 1926), Welsh travel writer and historian, lived in Cranbury for several months in the 1950s whose impressions of the town are recorded in the book Coast to Coast: A Journey Across 1950s America. Henry Perrine (1797-1840), physician, horticulturist and an enthusiast for introducing tropical plants into cultivation in the United States. ^ a b c Township Committee, Cranbury Township. Accessed July 12, 2016. ^ Administrator, Cranbury Township. Accessed July 12, 2016. ^ Township Clerk, Cranbury Township. Accessed July 12, 2016. ^ U.S. Geological Survey Geographic Names Information System: Township of Cranbury, Geographic Names Information System. Accessed March 5, 2013. ^ a b c d e f DP-1 - Profile of General Population and Housing Characteristics: 2010 for Cranbury township, Middlesex County, New Jersey, United States Census Bureau. Accessed July 5, 2012. ^ a b c Municipalities Grouped by 2011-2020 Legislative Districts, New Jersey Department of State, p. 7. Accessed January 6, 2013. ^ a b Profile of General Demographic Characteristics: 2010 for Cranbury township Archived 2011-10-06 at the Wayback Machine, New Jersey Department of Labor and Workforce Development. Accessed July 5, 2012. ^ Look Up a ZIP Code for Cranbury, NJ, United States Postal Service. Accessed July 5, 2012. ^ Area Code Lookup - NPA NXX for Cranbury, NJ, Area-Codes.com. Accessed September 2, 2013. ^ History, Cranbury Township. Accessed July 14, 2011. ^ John Quincy Adams diary 39, 1 December 1832 - 31 May 1835, page 179, Massachusetts Historical Society. Accessed September 2, 2013. ^ A history book on Cranbury says the accident happened 4 miles from Hightstown, putting the accident near today's retirement communities in Monroe Township. However, the book refers to John Quincy Adams' diary. See Chambers, John Whiteclay. Cranbury: A New Jersey Town from the Colonial Era to the Present, p. 50. Rutgers University Press, 2012. ISBN 9780813553580. Accessed November 10, 2015. ^ a b Snyder, John P. The Story of New Jersey's Civil Boundaries: 1606-1968, Bureau of Geology and Topography; Trenton, New Jersey; 1969. p. 169-170. Accessed July 5, 2012. ^ a b c d Cheslow, Jerry. "Historic, Sparsely Settled -- and Loving It", The New York Times, March 16, 1997. Accessed July 14, 2011. "The Middlesex County community is celebrating the 300th anniversary of the first documented European settlement in the area.... Cranbury pays tuition to send 106 high school students to nearby Princeton High School. According to Cranbury's Chief School Administrator, Robert J. Bartoletti, 87 percent of the town's youngsters go on to higher education.... As part of the addition, the 28,000-volume Cranbury Public Library, which shares space with the school library, is also being expanded to 6,000 square feet from 4,000 and the school's computers are to be enhanced through the networking of all of the classrooms into the library." ^ NEW JERSEY - Middlesex County, National Register of Historic Places. Accessed October 19, 2007. ^ Profile of General Demographic Characteristics: 2010 for Cranbury CDP Archived 2011-10-06 at the Wayback Machine, New Jersey Department of Labor and Workforce Development. Accessed July 14, 2011. ^ a b New Jersey: 2010 - Population and Housing Unit Counts - 2010 Census of Population and Housing (CPH-2-32), United States Census Bureau, August 2012. Accessed November 28, 2012. ^ Areas touching Cranbury Township, MapIt. Accessed July 13, 2016. ^ Compendium of censuses 1726-1905: together with the tabulated returns of 1905, New Jersey Department of State, 1906. Accessed September 2, 2013. ^ Porter, Robert Percival. Preliminary Results as Contained in the Eleventh Census Bulletins: Volume III - 51 to 75, p. 98. United States Census Bureau, 1890. Accessed November 22, 2012. ^ Thirteenth Census of the United States, 1910: Population by Counties and Minor Civil Divisions, 1910, 1900, 1890, United States Census Bureau, p. 337. Accessed July 5, 2012. ^ Fifteenth Census of the United States : 1930 - Population Volume I, United States Census Bureau, p. 717. Accessed July 5, 2012. ^ a b c d e Census 2000 Profiles of Demographic / Social / Economic / Housing Characteristics for Pompton Lake borough, New Jersey Archived 2012-08-01 at the Wayback Machine, United States Census Bureau. Accessed July 5, 2012. ^ a b c d e DP-1: Profile of General Demographic Characteristics: 2000 - Census 2000 Summary File 1 (SF 1) 100-Percent Data for Cranbury township, Middlesex County, New Jersey, United States Census Bureau. Accessed November 22, 2012. ^ DP03: Selected Economic Characteristics from the 2006-2010 American Community Survey 5-Year Estimates for Cranbury township, Middlesex County, New Jersey, United States Census Bureau. Accessed July 5, 2012. ^ 2016 Municipal User Friendly Budget, Cranbury Township. Accessed July 12, 2016. ^ Cranbury Township, Middlesex County, New Jersey. Accessed July 12, 2016. ^ District information for Cranbury Township School District, National Center for Education Statistics. Accessed December 7, 2016. ^ Blue Ribbon Schools Program: Schools Recognized 1982-1983 through 1999-2002 (PDF), United States Department of Education, p. 52. Accessed July 15, 2011. ^ 2009 Blue Ribbon Schools: All Public and Private Schools, United States Department of Education, p. 13. Accessed July 15, 2011. ^ Capuzzo, Jill P. "Cranbury, N.J.: One Town, Many Personalities", The New York Times, February 25, 2014. Accessed November 2, 2014. "About 545 students in prekindergarten through Grade 8 attend Cranbury School, which has twice been recognized as a National Blue Ribbon School of Excellence. For grades 9 to 12, they move on to Princeton High School, where there are 1,445 students." ^ Staff. "Cranbury trims 23 jobs in wake of aid reduction", The Times (Trenton), March 25, 2010. Accessed November 2, 2014. "Cranbury public schools serve about 600 students in pre-kindergarten through eighth grade. The district's high school students attend Princeton High School." ^ Board of Education Members Archived 2014-11-03 at the Wayback Machine, Princeton Public Schools. Accessed November 2, 2014. ^ School data for Princeton High School, National Center for Education Statistics. Accessed December 12, 2016. ^ Kilby, David. "CRANBURY: HHS alumni recalls how school used to be", CentralJersey.com, June 24, 2011. Accessed October 3, 2017. "Cranbury stopped sending its students to HHS in 1965, then it began sending its students to Hightstown-East Windsor High School. Cranbury students soon would go to Lawrence High School, then to Princeton High School, which is where they go today." ^ Home page, Cranbury Public Library. Accessed September 2, 2013. ^ Travel Resources: Interchanges, Service Areas & Commuter Lots, New Jersey Turnpike. Accessed July 14, 2011. ^ Mass Transit, Keep Middlesex Moving. Accessed October 2, 2014. ^ "Associated University Presses". Associated University Presses. Retrieved February 2, 2018. ^ Konick, Emery Jr. "Women's sports at center court", Home News Tribune, August 17, 2004. Accessed July 14, 2011. "Melanie Balcomb of Cranbury is the head women's basketball coach at Vanderbilt and one of the most successful young women's coaches in the nation." ^ 13-minute call bonds her forever with hero, Pittsburgh Post-Gazette, September 22, 2001. "Beamer, 32, of Cranbury, N.J., was the only passenger who dialed zero for the Airfone operator." ^ Chang, Kenneth. "Ronald C. Davidson, Pioneer of Fusion Power, Dies at 74", The New York Times, May 29, 2016. Accessed May 30, 2016. "Ronald C. Davidson, who oversaw one of the biggest advances in fusion energy research, attempting to replicate the power of the sun, died on May 19 at his home in Cranbury, N.J. He was 74." ^ Raynor, Vivien. "ART REVIEW;A Painter's Evolution, Visual and Political", The New York Times, November 12, 1995. Accessed July 5, 2012. "HUGHIE LEE-SMITH was born in Florida and schooled in Ohio and Michigan, notably at the Cleveland Institute of Art and Wayne State University in Detroit. He is nonetheless a New Jersey artist, and not just because of the many years he has lived in Cranbury." ^ Gaston, Joseph. Portland, Oregon, its history and builders:in connection with the antecedent explorations, discoveries, and movements of the pioneers that selected the site for the great city of the Pacific, Volume 2, S. J. Clarke Publishing Company, 1911. Accessed July 5, 2012. "The width of the continent separated Mr. Lewis from his birthplace after he came to the northwest for he was a native of Cranbury, Middlesex county, New Jersey, his birth having there occurred on the 22d of November, 1826." ^ Charles McKnight's Surgical Kit, Smithsonian Institution. Accessed May 30, 2016. "Charles McKnight was born in Cranbury, New Jersey, 10 October 1750." ^ Morris, Jan. "Once upon a time in America"[permanent dead link], Financial Times, May 9, 2008. Accessed August 27, 2008. "When I was resident in Cranbury more than half a century ago, it was a rustic haven in flat farmland country, with the remains of slave shacks, an 18th century inn, proud memories of the revolutionary war and a firehouse where firemen chewed the cud on kitchen chairs on the sidewalk outside, exchanging bucolic prejudices." ^ Wilkinson, Jerry. "Dr. Henry Perrine of Indian Key", Florida Keys History Museum. Accessed November 13, 2016. "Henry Edward Perrine was a descendant of a French Huguenot family who settled in New Jersey around 1665. He was born April 5, 1797 at Cranbury, New Jersey and taught school in Rockyhill, N.J. as a youth." Wikimedia Commons has media related to Cranbury, New Jersey. This page was last edited on 1 March 2019, at 22:26 (UTC).